Is Maple Syrup A Superbug Miracle Drug? You may have heard about the growing concern over the rise of antibiotic-resistant “superbugs.” these are bacteria, of course, that cannot be killed or treated with the antibiotics we currently have. If you are not aware of this concern, here is a fun fact: The United States Centers for Disease Control and Prevention estimate that approximately two million people (in the US) are infected with superbugs every year and at least 23,000 will die of these infections. Basically, common infections like gonorrhea and C. diff (which causes life-threatening diarrhea) may soon evolve to be completely resistant to all drugs. New research, though, suggests that perhaps it is not stronger—or better—drugs that we need. Instead, maybe taking the drugs we already have and combining them with something naturally abundant might be the key. This new research, out of Montreal’s McGill University, suggests that combining antibiotics with maple syrup could boost their efficacy. Well [natural] maple syrup actually has many antioxidant and anti-inflammatory properties. It also has nutrients and digestive benefits that can encourage improved uptake of antibiotics. To learn about this, the research team conducted two tests. The first test simply involved exposing various disease-causing bacteria to different strains of maple syrup sugar extract. This had no visible effect. The second test, however, combined the maple syrup extract with two common antibiotics. These are ciproflaxin and carbenicillin. The test was designed specifically to examine the potential boost to antimicrobial potency of these drugs. And boy, did it work! The researchers found that when they mixed the maple syrup extract with these drugs, they only needed about 10 percent of the normal amount of the antibiotic as a normal dose. The team then went on to test the solution against several other bacteria (including E.coli and Proteus mirabilis and Pseudomonas aeruginosa). In another, unrelated, study, researchers from the University of Rhode Island found that maple syrup can actually encourage the proliferation of good bacteria in the gut. 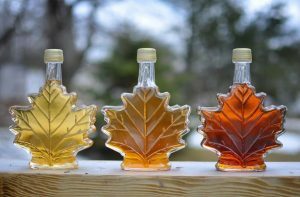 The two studies, then, could help to encourage more investigation in the potential health benefits of maple syrup.